Author: Anne Storch. Series edited by: M. Lionel Bender †, Franz Rottland †, Norbert Cyffer. Western Nilotic forms one of the three coordinate branches of Nilotic, which itself is a branch of the Eastern Sudanic phylum. Most Western Nilotic languages are spoken in Sudan and Uganda, but the subfamily also extends into Ethiopia, Kenya and the Democratic Republic of Congo. A large number of these languages are spoken in areas that have been severely destroyed by civil war during the last 30 or 40 years. The consequences are many displaced and dead people, so that the languages lost many speakers, at least in their original homelands. Language change and language death also play a role, especially where smaller languages rapidly disappear in favour of neighbouring Bantu languages. Almost all of the individual languages have been little studied because of their complex phonologies and diverse systems of noun morphology, number marking and categorisation. At the same time no comparative study of these languages exists, so that the present book aims at filling two gaps: to provide a first comparative analysis of the nominal system and secondly to present new data that has been recorded and analysed with contemporary methods and thus may substitute much older data in this respect. In this book an overview of the entire language group is provided, including a list of all members of the branch. 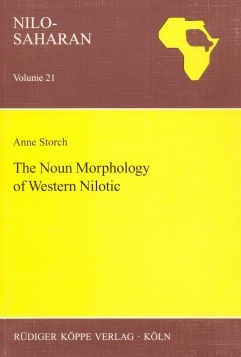 A survey of the descriptive situation with a focus on works on noun morphology and reconstruction is presented, followed by an insight into the theoretical and methodological framework of the study and an overview of the phonology of Western Nilotic. The main part of this volume is entirely devoted to a detailed description and analysis of noun morphology. Every descriptive section is intended to fit into a wider discussion of noun categorisation devices and into a typological and cognitive context. Finally the author intends to illustrate how linguistic categorisation reflects human culture and cognition by exploring other categorisation patterns like ophresiological vocabulary and colour terminology. [...] the book, which, in my opinion, is an excellent reading for those who are interested in Nilotic languages because it contains a great amount of language data subjected to a detailed analysis. It may also be recommended to all scholars interested in morphology, typology, cultural anthropology or cognitive linguistics.